We hope everyone is enjoying the summer sun! 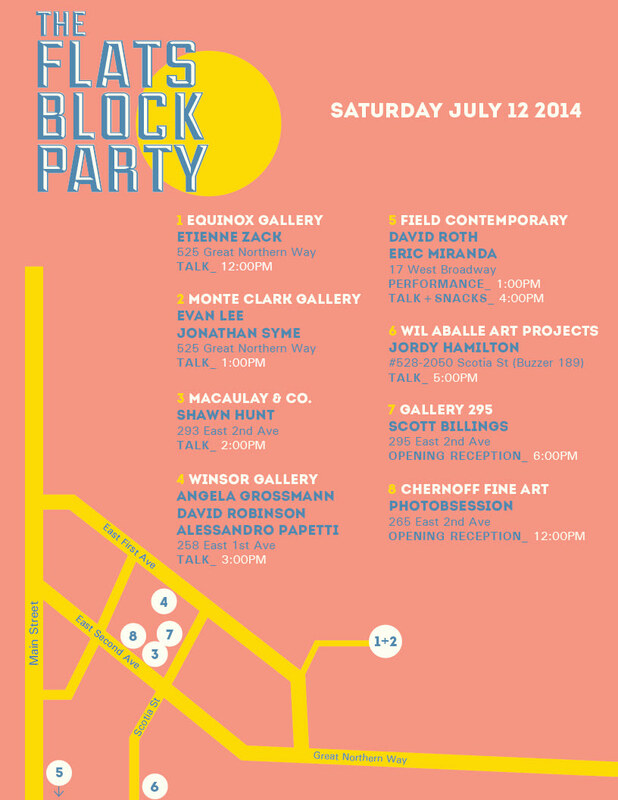 Tomorrow, Saturday July 12, Equinox gallery (Great Northern Way) and seven other galleries are hosting the second annual “Flats Block party” (“The Flats” as a district has fifteen galleries and artist run co-ops in total). Equinox Gallery is hosting the opening reception at 12pm with the accompanying artist talk by Los Angeles based artist Etienne Zack to discuss his paintings. Evan Lee will be discussing his sculpture, mixed media, and painting based on news images at the Monte Clark Gallery. The talks will kick off a day of mind opening work that will further define the emerging “flats district”, an area of pulsing artistic activity, where the creativity is ever-expanding. It will be a day of discovery very well spent. The flats block party will be going until 7pm.